I’ve been meaning to do this for a long time. I finally got around to finishing off some changes to the art brush tool and now I’m ready to put them up. In the main tool things are mostly the same. I fixed compatibility with CS5, so now die-hard Art Brush users can upgrade, and die-hard CS5 users can finally use the tool. I also improved rendering of corners. Seriously, it does corners way better now. It might still need a little improvement, but at this point changes would be a judgement call of whether they’re better or now. Basically, now what the tool does with corners is to try and make the diagonal of the corner be the same width as the brush would be at that point anyway. … a version that recolors the brush stroke! Now all the shapes in the brush symbol will be drawn out using the current fill color. 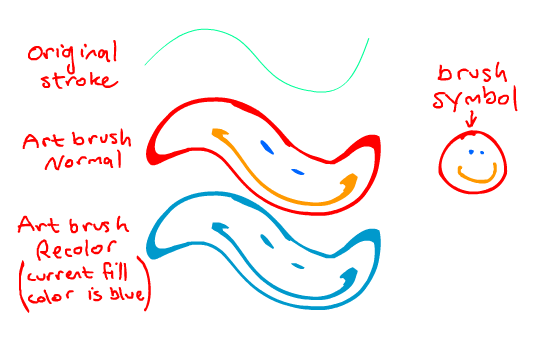 This makes it possible to use the art brush tool as a more generic paintbrush, where the brush symbol only defines the shape of the resulting stroke. I use it a lot for creating linework on characters. Below is an example of the output. One of the advantages of the new “recoloring” art brush is that it’s more backward compatible. In fact, it may be compatible as far back as Flash MX 2004! I can’t say for sure, since I don’t have a copy of that program. I would definitely be interested to hear results from anyone who tries it on a version of Flash prior to CS4. Leave comments here or email me. As a reminder, these tools are free for non-commercial use but there’s a small fee if you’d like to use them in a commercial setting. Contact me for more information. Well, I’m afraid I just did a test and it doesn’t work in Flash CS3. It has the potential to, though, and I’m going to see if I can get it there. A few quick changes later and I got it working in CS3! Turns out it was just one small block of code that wasn’t backward compatible. Now it works back to CS3 and perhaps even in earlier versions. Please let me know if anyone has any luck with versions before CS4. There are some caveats, though. The biggest is that you can only use the “recolor”. If you try using the “normal” one it’ll actually do the same thing as the “recolor” one. Second, your brush symbol can’t have any empty enclosed spaces in it. I’m afraid if it does then those spaces will probably just be filled in. Finally, when you create your brush symbols you have to then go inside the symbol and deselect the art. For some reason, unless you do that, it won’t render correctly when you use it as an art brush. I’ve downloaded the art brush file and installed it, very eager to try it’s splendor… But nothing seems to have changed. There is no added items in the command drop-menu, and there is no indication that anything is different at all. Off the top of your heads, would you know why this is happening? Cause I would love to be able to use this awesome feature. My best guess is that maybe you have multiple copies of Flash installed, and the brush tool installed in the one you don’t usually use. Perhaps you normally use CS4 but you have an expired CS5 trial version? In that case, the brush tool installer probably opened in the CS5 extension manager. You just nee to make sure you open it with the extension manager corresponding to the version you want to use it with. If this isn’t the solution please let me know, and I’ll tell you how to manually install the files. I’ll just need to know which version of Flash you’re using. The multiple-flash copies solution was the first thing I considered as I was trying to figure out the problem. But, alas, I only have 1 flash copy, CS4, so the solution seems to be something else. The manual installation of the files may probably be the easiest solution without tearing my files apart, so any help with this would be very much appreciated. Thank you very much, for your time and effort! No worries! I am thinking of going ahead with using it in CS3. Any ideas on how to modify the code to leave the undelying original line at full alpha, not 0? I’m trying to figure out how to modify the include file on my end … so much code! You’ve really done something incredible here! Also … do you see it possible to do the recolor function, but instead of using the current selected fill colour, it would use the original line colour? Basically, if I have a design with a bunch of self trace coloured edges (lines) that I want to brush, it would keep their original colors. Let me know if you can think of how to make that happen code wise and maybe I could dive into it here. I tested in flash CS3, and it seems that ‘art brush normal’ is working as ‘art brush recolor’ losing the original colors in the symbol. Any way to get instructions to modify it to work with CS3? This is a great tool I would love to be able to use!!! This is great! wonderfully done and greatly appreciated. I tried at this for a few hours, and was wondering if you could help me out. I want to be able to apply this to an animation; say a 10 frame animated seaweed. using just a line of course. Is there any way you could help me edit the jsfl so that I can simply highlight the layer with the animation, and have this apply to every frame on that layer? The reason is for things that are animated over hundreds of frames, it would be a very tedious process to manually apply this to every frame. How can I download it for Mac?